Why’s it so hard to go to a 100% renewable energy system? We often hear how renewable energy systems could easily power the world. Just throw up some solar and wind, add some hydro, and voila! we’re running on clean energy. Unfortunately, though, it’s not that easy. Transferring to 100% renewable energy is fraught with difficulties, Today we’re going to focus on one huge issue with renewable energy: controllability. When discussing why moving towards 100% renewable energy is so difficult, let’s start by saying that it’s not all about cost. According to a 2016 study by the financial advisory firm Lazard, wind and solar are cheaper sources of electricity than both coal and natural gas (which together account for about 2/3 of all our electricity in the US). In fact, natural gas and coal can be 2 to 3 times more expensive than wind and solar! With this in mind, why aren’t all the utilities jumping at the chance to install wind and solar? Well, there’s more to running a successful utility company than just providing the cheapest electricity possible. You also need to provide consistent electricity, meeting all customer demand day and night. Utilities need to be able to control how much electricity to put on the grid and at what time. If you can’t, that means blackouts! And this is where issues with renewables come into play. Besides a handful of projects owned by a few utilities, most utility companies don’t have any way to store electricity. By necessity, all the electricity they generate goes immediately into the grid for us to use. When we all get home and start using our AC, stove, and washing machines, the utility has to plan for that and start pumping out more electricity immediately. 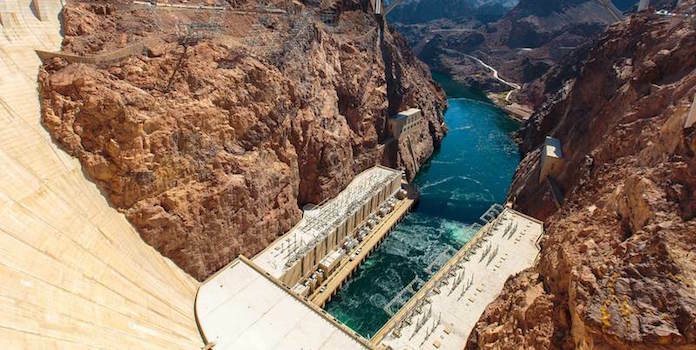 Over the last 100 years, they’ve gotten really, really good at planning for and producing just the right amount of electricity at just the right time. This is why utilities love coal and natural gas. Both are tangible things that can be sold, moved, and put into storage. In other words, they’re tradable commodities. If a power plant needs coal right now, they can pull from their stockpile. Running low on fuel? Better order some more natural gas soon. They can buy it, store it, and use it whenever they like. This isn’t the case with solar and wind power, however. Once the solar panels or turbines are installed, that’s it. You can’t create more wind if you need more power. 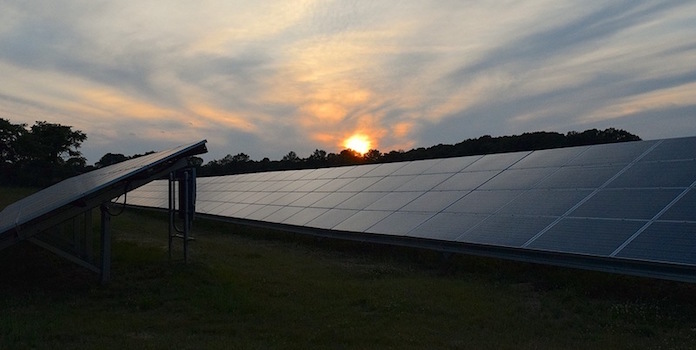 The sun goes down every day and solar panels stop producing electricity. 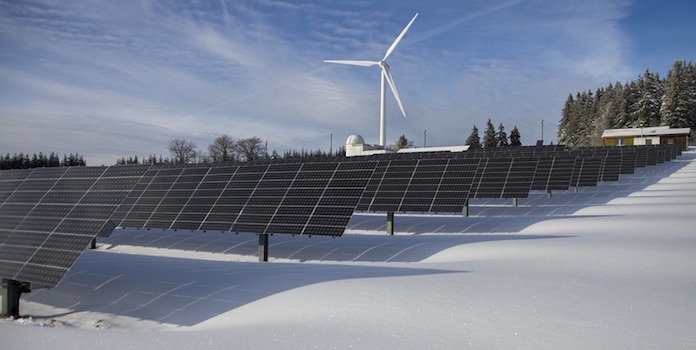 We’ve probably all heard that solar and wind are inconsistent and therefore difficult for utilities to plan for, but that’s not the whole story. Yes, it’s difficult to estimate exactly how much electricity one single solar installation, or one single wind turbine, will produce. And spikes in solar energy throughout the day can cause headaches for grid operators, who (in California at least) send info on energy needs to power plants every 4 seconds (yes, you read that right, every four seconds). But all these little bumps even out when you take a step back and look at the energy production from an entire region’s solar and wind supply – with thousands and thousands of systems in place (which depends on the area, of course). 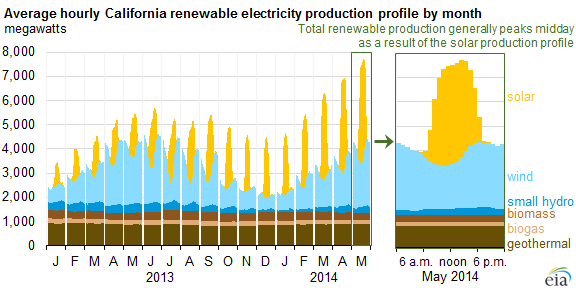 Take a look at the graph below from the EIA of California’s average hourly solar energy production each month. Far from being inconsistent, you can see a well-defined pattern for both wind and solar that follows the seasons: high energy production in the summer and lower production in the winter. As we said, when looked at from a distance, solar and wind production is actually fairly consistent and can be planned for. But again, that’s not really the issue. The issue is that, unlike coal and natural gas power plants, solar and wind aren’t constant and they can’t be controlled by the utility. 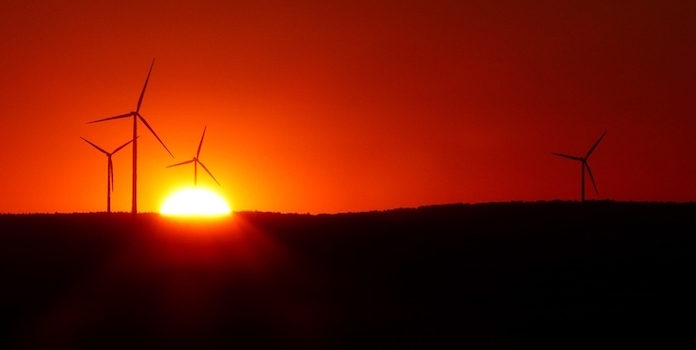 Utilities can’t decide when to add more fuel to a solar or wind farm. Take a closer look at the highlight on the right side of the graph above. Note how solar production is highest around noon. Remember that in your brain: noon = highest solar production. This is important for what’s coming next. Look closely at the graph above. What do you see? When are we using the most electricity in a day? Is it at noon, when solar is producing the most electricity? No! 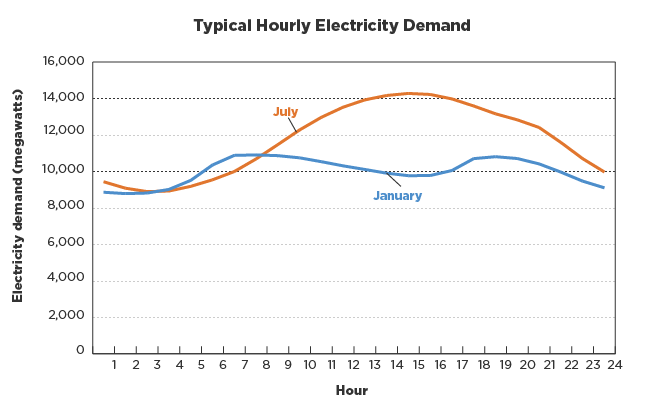 Electricity use peaks around 2 or 3 PM in the summer as we’re all using our air conditioning and 6 PM in the winter as we all get home from work, turn on lights and cook hot meals. Do you see the issue here? There’s a huge gap between when solar produces electricity and when we actually need electricity. This is the issue that opens up a can of worms for utilities and leads to a very acute problem known as the duck curve. Not quite as fun as a real duck, but interesting none the less. You might be wondering why this is a problem. More and more solar? Why is this a bad thing? That’s great! From an environmental perspective, that’s certainly true. From a logistics perspective, it’s a hard nut to crack for utilities. Look a little closer at the graph. While demand is decreasing during the middle of the day, that peak use around 7 PM stays roughly the same – and that’s the issue. Check out the line for 2020. See how sharp that ramp up is from 3 PM to 7 PM? The issue is that, in a very, very short time, utilities will need to ramp up electricity production by over 200%! This is where that disconnect comes in between when all the solar systems are producing electricity, and when we are actually using electricity. As we said, utilities can’t control when solar panels produce electricity, so they’re left to work around that production and ‘fill in the gaps’. And as more and more solar is installed, it becomes more and more difficult. You might be thinking this is only really a problem for the utilities – just let them figure it out. But in all honesty, it’s an issue for everyone. These are the kinds of problems we’ll need to solve if we want to continually adopt more renewable energy. How do we solve this issue? Let’s look at a few solutions being thrown around. People have come up with a variety of solutions to the intermittency of solar and wind energy. Many believe batteries offer the best way to store energy and combat the duck curve. The idea is to fill in the gap created by solar with instantly-available battery power. 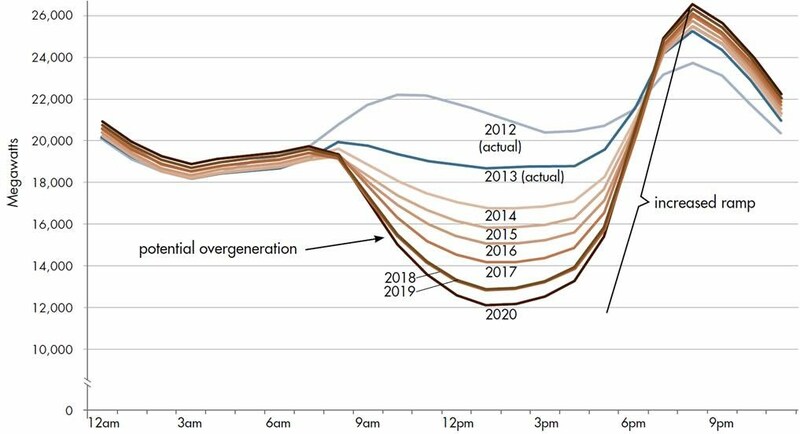 Ever since the idea was introduced in California in 2013, utilities operating in the state as well as regulators have begun adopting energy storage projects specifically to ameliorate some of the duck curve’s effects. In April 2017, the National Renewable Energy Lab even began testing battery storage for solar to figure out the best ways to integrate the technology into the grid. However, this raises an issue we dealt with at the beginning of this article: cost. When we include the cost of storage, solar is much more expensive than fossil fuels! How do we solve this issue? Well, first, the cost of lithium-ion batteries has dropped immensely over the last few years, making storage a more viable option financially. As Tesla finishes up its Gigafactory and R&D continues at other companies, we can expect ever dropping prices in the future as well. Even still, battery storage today is really only an option in markets with high electricity prices (like California). Others think we can solve the problem of intermittency by creating the perfect mix of renewable sources. By finding the perfect ratio of land-based wind (which typically produces the most electricity at night), coastal winds, and solar (both of which produce the most energy during the day), we can provide the right amount of power at the right time. Still others, including (or at least reported by) the LA Times, believe that nuclear power can fill the gaps created by solar. How exactly we’ll solve this problem is yet to be seen. We’re still in the beginning stages of the duck curve, though it’s coming on even faster than originally predicted. One thing though is clear: while it’s a headache, it’s actually a good headache to have. We have to solve this problem because there is so much renewable energy on the grid. One challenge defeated is one step closer to 100% renewable across the world!